As you know, some of my favorite recipes are those that start out as one thing, but turn into something completely different. 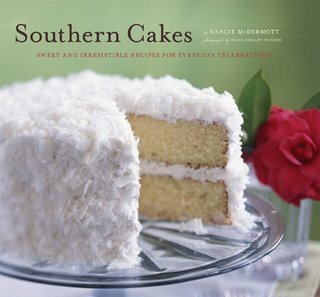 I started making the Buttermilk Cake with Old-Time Fudge Icing from my Southern Cakes cookbook. Our local strawberry vendor paid a visit while my cake layers were in the oven. Now, who can refuse a kilo of organic strawberries for 20 pesos? That's a little over 2 pounds of strawberries for less than $1.50! My Hubby bought 2 kilos, then turned to me and said that he wanted me to make him the cake that is on the cover of my Sky High Cakes cookbook. Since I already had the Buttermilk cake in the oven, I decided to turn it into a Buttermilk Strawberry Shortcake. It was AMAZING! Heaven on a plate! The cake itself was moist and tender. The strawberries were the perfect balance between sweet and tart. And the billowy layers of whipped cream were light and airy. *If you don't have buttermilk, add a teaspoon of either white vinegar or lemon juice to 1 cup of milk. Let stand for 10 minutes before using. Preheat your oven to 350 F. Grease and flour two 9-inch round pans. (Or three 8-inch round pans.) In a medium bowl, combine the flour, baking powder, salt and baking soda; stir with a fork to mix well. Set aside. Add about a third of the flour mixture; beat at low speed just until the flour disappears. Add half of the milk; beat at low speed just until milk disappears. Mix in another third of the flour, followed by the rest of the milk and then the rest of the flour in the same way. Bake at 350 F for 20 to 25 minutes, until the cakes are golden brown and spring back when touched lightly in the center. Cool the cakes in the pans on wire racks for 10 minutes. Remove cakes from pan and continue to cool until room temperature. While the cake layers are cooling, hull and slice the strawberries. Toss the strawberries with the 1 cup of sugar, ground cinnamon and vanilla. Set aside for 10 to 15 minutes. Place one of the cake layers top-side down on a cake plate. Spoon half of the sliced strawberries and their juices over the cake. Top strawberries with whipped topping. Place the other cake top-side down over whipped topping. Top with the remaining strawberries and whipped topping. Leslie, what type of sugar are you using, cause it doesn't look like regular white sugar. I just got my sky high book last week and I can't wait to make that strawberry shortcake! Looks so yummy!!! This is the best of both worlds. And I can't believe you got strawberries for so cheap- lucky you! Your cake is beautiful and I love that you added cinnamon to the filling. Hope you have a wonderful weekend Leslie. Sounds scrumptious Leslie. Hope someone bakes one for you this Mother's Day. Are you using turbinado sugar? Jenny & Mo: I am using regular granulated sugar. The reason it looks a little different is because sugar is less refined in Mexico. Okay, on Mother's Day I want someone to bake this cake for me and i want a piece, a really big piece! Thanks for sharing the recipe. Wow, that looks delicious! And I think I could actually make it with your great directions and photos! ANNA: This cake is very easy to make! CAROLANN: So, what did you end up making with your strawberries? Looks superb!! Ahh, the strawberries, yumm!! What kind of whipped topping are you using, here in Mexico it's called something else. Can you tell me what the Mexican name is..thanks mama! I LOVE how your cake turned out, piled so high! Those cookbook cover pics look awfully tempting, too. Wow! It looks delicious I'm looking forward to tasting it. It really seems like heaven! making this tonight!! looks so good! Love all of your recipes! Just made this! Esta para chuparse los dedos! Thank you!!!!! I feel like a real baker.